Eye On Golf will begin 2007 with a couple of soul-baring revelations and one cautionary note to our faithful readers. The first pertains to our organization itself and the other with my own personal trials and tribulations as a golfer and a writer. (Unfortunately, this will not be autobiographical in nature.) Finally we’ll examine the reading habits of our readers. I would suspect that few of Eye On Golf’s fans are aware of the size of our organization. In the past couple of years we have not only increased our journalistic duties, but also the size of our staff. We have added a photographer and an editor/copy editor. Despite this increase in staff, we have determined to remain in the same one story structure that we currently occupy. We have, however, elected to construct a small addition for much needed office space. Life is really good at Eye On Golf and we anticipate a terrific 2007. On a personal note I have two items to share – actually they are New Year’s resolutions. One is that I have increased determination to become more disciplined in my journalistic endeavors. That means I will attempt to write something of quality and quantity on our various projects every day – just like we’re doing now. You, our faithful readers, will be the beneficiaries. Concerning my own personal golf game, I have decided to take one of my own suggestions to heart and vow to do something every day to improve my game. Even if it’s just hitting a few putts or reading an instruction book for a while, that is valid. 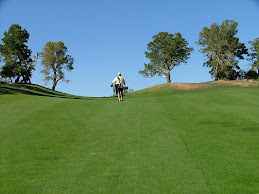 In golf every tiny step toward improvement is worthwhile. Finally, I want to thank and encourage all of you who read the golf blogs. All of us who blog on this great game have no hidden agenda. We’re just average golfers who love the game and want to give an honest opinion on the game. We are not influenced by advertisers or controlled by editors. It’s our game and we want to keep it that way. Have a happy and prosperous golfing 2007.